The ideas draw on the likes of Seneca, Marcus Aurelius, Zeno and many others for wisdow that has lasted through the ages and most of which is interpreted for the modern world by the authors. The book is presented as a single idea or theme for each day of the year so that you can reflect daily on that idea and how you might apply it to your own thinking and interactions with others. January: Clarity. What do you really want? What is your purpose? What can you truly control and what must you accept? February: Passion and emotions. Where do you react to things emotionally where it doesn't actually help? Is anger ever useful? March: Awareness. Do you evaluate yourself honestly? Do you give away your attention or freedom to other people without realising it? Do you blame others for wronging you when they have done nothing wrong? Then much more every month for the rest of the year to help you be disciplined in your perception of the world and others and ensure you take the right action in your daily life. 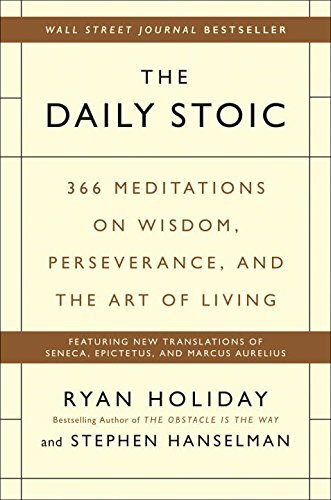 Are you following The Daily Stoic this year? Are you following along with the accompanying journal too (see "Similar Books" below)? If so, please comment below with how it is helping you and share your experiences with others who might benefit from some ancient wisdom.